COTTONWOOD HEIGHTS — Austin had its charms, but it had its problems, too. Michael and Kendle Webster, a young couple in their 20s, found themselves increasingly disenchanted with the Texas capital after a year of living there. He was frustrated with his commute — one hour each way to cover just 18 miles between their apartment and his workplace. And she was frustrated by the cost of living — working two part-time jobs, while pregnant, to help pay for a one-bedroom apartment. So when a friend told Michael Webster about the booming tech sector in Utah, he decided to apply to a few companies. By July, he had secured a job at Instructure, a software company in Cottonwood Heights, and the Websters moved to Utah. They are part of a wave of people who moved to Utah within the last year, pushing the population past the 3 million mark and making the Beehive State the fastest-growing state in the nation. 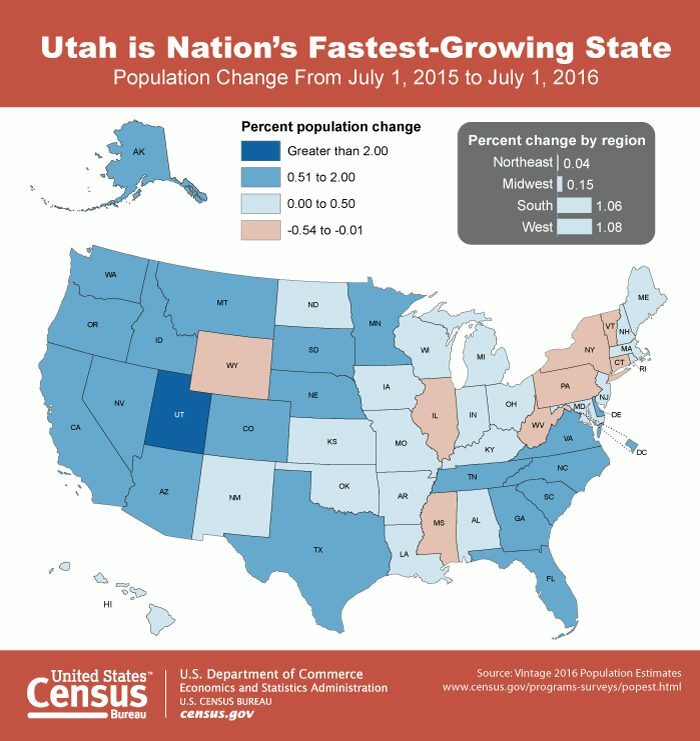 According to U.S. Census Bureau estimates released Tuesday, Utah's population grew by 2.03 percent from July 2015 to July 2016. The fastest-growing states after Utah are Nevada (1.95 percent), Idaho (1.83 percent), Florida (1.82 percent) and Washington (1.78 percent). North Dakota, which had been the fastest-growing state for the past four years, fell out of the top 10 after a large number of people moved out of the state to other parts of the country. Webster said he’s somewhat surprised that Utah is growing so quickly, but can see the appeal of the plentiful jobs, access to the outdoors and low cost of living. "I like my job considerably more than before,” he said. “And having family so close and having so much more to do here... It just feels like there's so much more of a community here." Economic opportunity is driving population growth in Utah, said Pam Perlich, the director of demographic research at the Kem C. Gardner Policy Institute. The Beehive State still has the highest birth rate, lowest death rate and youngest population in the country — homegrown advantages that contribute to Utah’s fast growth. But only about 60 percent of Utah’s population growth in the last year came from natural increase — births minus deaths. The rest came from net migration, which is the number of people moving to Utah versus the number moving out. “That’s pretty amazing that that proportion is coming from net migration,” Perlich said. The dynamics of Utah's large families "continue, but they are not the only story," she said. "The other story is that net migration to the area has been very clearly re-established." It’s heartening to see migration pick back up after virtually grinding to a halt during the recession, according to Perlich. Utah's population is now estimated at 3,051,217. The Kem C. Gardner Institute and Gov. Gary Herbert celebrated the milestone in October, but this is the first time the U.S. Census Bureau has confirmed that Utah surpassed the mark. Utah now moves from the 34th most populous state to the 31st, leapfrogging Mississippi, Arkansas and Kansas. The top states in raw growth were Texas, which gained more than 430,000 residents; Florida, which gained 360,000 residents; and California, which gained 256,000 residents. Coming in at No. 11 was Utah, which added 60,585 residents over the last year. Perlich called that "eye-popping" given Utah's relatively small population. The U.S. population overall grew by 0.7 percent, to 323.1 million — the slowest national growth rate since the Great Depression, according to Perlich. In Utah and nationwide, fertility rates are still falling and the population is aging. Eight states lost population, including Pennsylvania, New York and Wyoming. “We see the imprint of (the recession) in our vital statistics,” Perlich said. She added: “These are not rip-roaring growth rates. It's a moderate rate of growth. But we definitely appear as a hot spot."